The above table represents a rental contract for a wedding I helped to plan at an off-beach location. I thought a future bride might want a comparison chart to use to check prices. I have given this to quite a few brides before they began their planning. I hope you can use it. This was a buffet/sit down dinner. This was Erin's wedding (see photos under weddings). The table below is Emily's wedding (see photos under weddings). This tent was attached to the side of a house. The party was not a sit-down dinner, as people were in the house and tent. 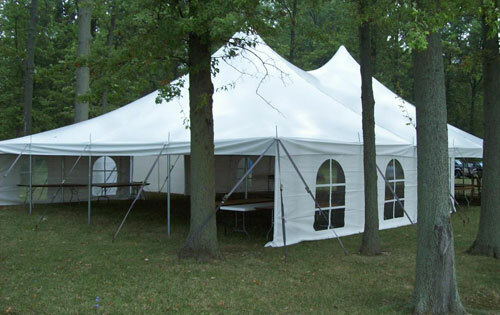 They saved money on the dance floor by putting the tent over an existing patio. It worked beautifully. Set up of the tent was an added charge. Even though the chart doesn't add up to around $1708 that was the final contract.